I hadn’t come across this book or heard of it, despite it being a best seller, before seeing it in the book shop and deciding to give it a try. It is from one of my favourite genres: dystopian sci-fi and the premise reminded me of one of my favourite books: The Handmaids Tale by Margaret Attwood. Whereas The Handmaids Tale is set in an indeterminate future and feels frightening, but almost impossible in its portrayal of an extremely misogynistic future version of America (interestingly Attwood said that “when it first came out it was viewed as being far-fetched…However, when I wrote it I was making sure I wasn’t putting anything into it that human beings had not already done somewhere at some time”). Vox is barely one presidential term beyond the current, real one, with a future that you could almost see happening. 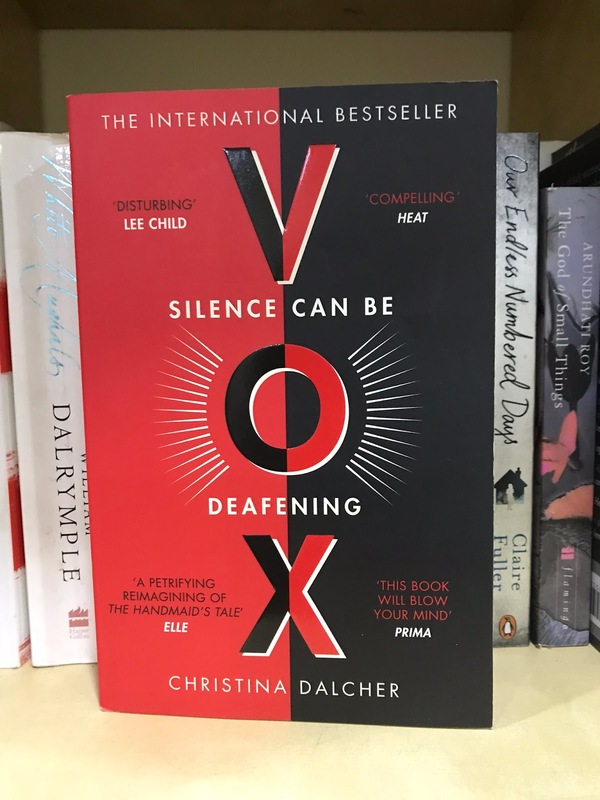 Vox is set in an America where Trump has been succeeded by an evangelical Christian administration that decided women should be silent. Women are fitted with counters on their wrist that count their words - a daily of quota of 100 words, with anything above leading to increasingly painful shocks that leave burn marks. Jean is an expert linguistic who is forced to leave her job and teach her daughter to speak as little as possible, while her husband and sons get on with life, increasingly failing to see her frustration and accept, even enjoy the new status quo. Jean struggles to see a way out until the Presidents brother suffers a stroke and the government seek her help in treating him. Jean starts to see a way out and the beginnings of a resistance. It’s almost impossible not to compare this book to The Handmaids Tale and I initially worried it would be a poor imitation. But I was pleased to see that Dalcher’s novel followed its own path and took on a life of its own. Whereas the future in Attwood’s book is extreme and horrifying, Vox has us believing that there are groups capable of doing these things in America right now and many that would quietly support them or tolerate them. I was in two minds about the story until it diverted from being too similar to The Handmaids Tale, then the impossible situation and the feeling that it was too difficult and dangerous for anything to be done came to the fore. The resolution was an absolute joy and worth reading the book for.